Customers have always asked us whether it is advisable to use URL shorteners with their QR codes. URL shorteners allow you to simplify a long and complex URL into something that is very short and simple. The shortened URL is even shorter than the main New York Times' domain! Why should you care then? QR codes rely on the number of characters or data you encode. In short, the longer the URL, the more complicated the QR code becomes. If you are coming up with a QR code, a shortened URL would mean that you would be able to generate a simple QR code with less pixels in it. This will prove extremely useful in making your QR code easily scannable. A short URL can also give you a QR code that has big pixels, which makes it easily scannable even when you are far away. What's more, if you are looking to customize your QR code, it would be very easy to customize a simple QR code and still make it work. If you want to be able to track your QR codes, then a very simple way to do it is to use a URL shortener. Most URL shorteners provide their own statistics such as how many people used the shortened URL to access your page. With AzonMobile, we need to redirect the traffic to our own servers in order to track these for you. Do not worry, we are not using these redirects other than to provide you with all the necessary tracking information that you need. Of course, there are downsides to using a URL shortener. For one, your customers might be hesitant to scan a QR code that resolves to a shortened URL. This is because shortened URLs are being used by hackers to hide malware and malicious sites. When you use a URL shortener, you are using a URL that starts with a very generic bit.ly or goo.gl. People would have no way of knowing where these shortened URLs ultimately lead to. But AzonMobile makes use of its own URL shortener for our QR codes. Our URL shortener is not available to the public, so our domains are off limits to hackers and cybercriminals. Also a good way to assure your customers that it is safe to scan your QR codes is to use a customized QR code. Seeing your logo in the QR code would tell them that it is from you. Or you could tell them beforehand what your shortened URL is, so they could verify it first before allowing their QR code scanning application to access the page. Using shortened URLs with your QR codes should be a standard practice for every advertiser. 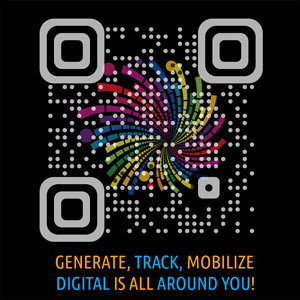 AzonMobile encourages you to use URL shorteners to help make your QR codes simple, easily scannable and trackable!